Here’s my dishtowel apron for September’s Tie One On. Thanks for coming up with another great theme Amy. I didn’t have any twill tape on hand but I did have a big long piece of soft cotton embroidered lace that I tore off a thrifted sheet years ago. I think it turned out cute and once again proves that if you keep something around long enough it will find it’s destiny. Neat that your recent find fitted in with the theme, eh! Those look very good togeether – nice work. Hey, I have the napkins that match that dish towel. Your apron is too cute! I love that big bow, it’s like an Edwardian ladies dress, that accentuated the derrier. What a fabulous towel and the lace is just wonderful! You always manage to make something simple look fabulous! i love the lace! The apron is adorable, now all I need to do is get off my bum and get sewing! you are so right about holding onto things long enough (though try explaining that to my husband:) the lace was absolutely the perfect addition to your apron. holy crap! soooooooooo happy you didn’find twill tape becasue the lace is PERFECT! this was so simple and you made it so amazing! you blow my mind. it commands attention and leaves you speechless. I love the combo of the rich colours of the towel with the whimsy of the lace bow. Great work! WOW, this is just perfect. I love the lace ribbon, it’s gorgeous. Such a simply idea! Congrats! thank goodness you didnt throw away that lace, your apron is beautiful! SWEET apron, Hillary. I love it. This is SO perfect. I love it! This is great. Practical and pretty at the same time. Nice work! 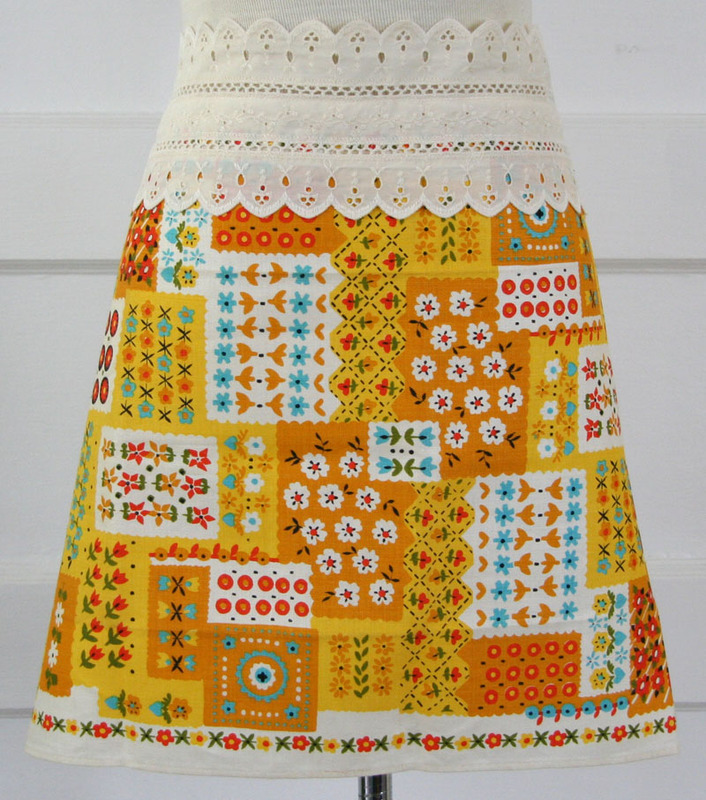 The tea towel is amazing, and the lace is just perfect! Another design coup Hillary! That is really beautiful. I love the fabric. That is SUCH a cute dishtowel.. I’m jeaous! And the lace suits it perfectly! What a gorgeous teatowel and that lace just dances hand in hand with it. Great combo. I have a few aprons with big bows in back and they are so much fun to wear! 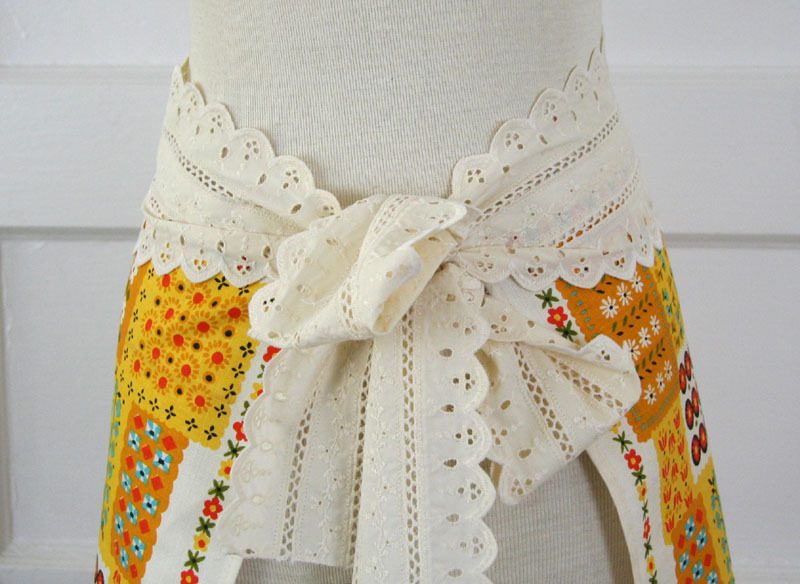 I love aprons and this one is absolutely adorable! !